Home » Did Bob Barr swipe his immigration policy from Barack Obama (or Bush, McCain, Clinton,...)? Did Bob Barr swipe his immigration policy from Barack Obama (or Bush, McCain, Clinton,...)? Libertarian Party contender for president Bob Barr was interviewed by Neal Boortz a few days ago, and the audio and a partial transcript is here. Part of the conversation involved immigration matters, and based on that I have trouble seeing any major difference between Barr's positions and those of Barack Obama, Hillary Clinton, John McCain, George Bush, Teddy Kennedy, and on down the line. 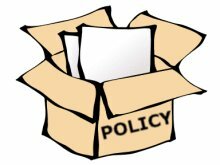 In fact, it's like his campaign was the recipient of a blank cardboard box with just the word "POLICY" stenciled on it. "I think as a practical matter, that makes a lot of sense. I'm not sure how you would go about rounding up millions of people and trying to deport them. The key here is security..."
"We are not going to send [illegal aliens] home... I want us to have an honest conversation about this." ...Mr. Obama said many illegals have "settled," "bought property" and have children who are U.S. citizens. He said the country would have to devote "all our law enforcement resources to rounding up people without papers, even if they weren't causing any trouble," and once that's done, the country would have to "empty out our jails..." ..."Imagine what that would look like, basically detaining, putting in jail 12 million people. We're not going to do that..."
And, in fact, all of those listed above have made similar arguments. And, all of those arguments are wrong: they offer a false choice and fail to note other alternatives such as attrition. Under that plan we'd enforce the laws now and reduce non-emergency benefits to illegal aliens, causing many to leave voluntarily. Neither an amnesty nor mass deportations would be required. Barr also said that neither the Dems nor the GOP are making border security a priority. To a large extent that's false, since the leaders of both parties supported "comprehensive immigration reform" and all three major candidates support some form of border enforcement, or at least pretend to. As a political matter, Barr's position makes little sense (unless there's "something else" involved). He doesn't seem to have an ideological standpoint on this issue, and aside from using them to get the nomination there's little reason for him to reach out to the extremist libertarians on this issue. On the other hand, there's nothing to differentiate him from the three major candidates on immigration, an issue that many people care about and that the vast majority of Americans would care about if someone were able to explain everything involved in this issue. Barr is also going to face a lot of heat from the GOP; see for instance Sean Hannity's attempts to portray him as someone who'd like to make crack and heroin legal. He's going to be ferociously attacked by he has no effective way to fight back against McCain. McCain's weakest point is immigration, yet he can't attack him on that issue since their positions are basically the same. If Barr saw the light and decided to very aggressively go after all three major candidates on this issue he could have a very powerful impact on the presidential race. He'd have to explain everything involved, including topics that are frequently ignored such as the political power that foreign governments have been able to obtain inside the U.S. and the fact that illegal immigration is an indicator of political corruption. He'd also have to deflect attacks from those who support illegal activity, but that really isn't that difficult. And, he'd have to aggressively attack his opponents on this issue such as by sending his representatives to their campaign events to ask them embarrassing questions designed to point out the hugely obvious flaws in their policies and designed to discredit them. However, based on what I've seen so far it looks like Barr isn't going to run an "insurgent" campaign but simply one designed with other goals in mind. When you find them, you ship them home, absolutely. First of all, I think it would be terribly costly. And whatever border fence you build, people are going to find a way to get around it, go under it, go over it, somehow... I think it would look absolutely awful. And even though it`s a fence to keep people from coming in, as opposed to the Berlin wall, it gives the same impression. Not the impression I want to give the world about America. Needless to say, it's not difficult to find other hacks saying something almost identical to that. Just another dumbshit running for President. Join the crowd. No Light only BS. eh is dead on.